Meanwhile, Zak’s friend Tiff Masterson is overwhelmed by her mother’s escalating mental breakdown and her aunt’s stubborn denial of the problem. Tiff assumes the root of the problem is the death of her brother and father sixteen years ago. But the real atrocity goes back much further than that. When the truth is revealed in a shocking twist, Tiff’s world is turned completely upside down. The ramifications affect many of the most prominent citizens and provide the missing clue to Lacy Stillman’s murder. By midnight it would be done. Irrevocable. There was no reason to feel guilt. The old woman had lived a long life on the land she loved, and she was leaving behind two sons and three grandchildren to carry on her legacy. If she’d been a different sort of woman she could have relaxed and enjoyed her golden years. But Lacy Stillman was a strong, interfering, opinionated person. And so she had to go. Zak Waller was at the coffee machine when the call came in to the Lost Trail, Montana, Sheriff’s Office. He’d been about to offer a refill to Deputy Nadine Black, mainly to see if she’d stop communing with her laptop and actually look at him—something she’d avoided doing since she showed up at work two hours ago. Zak had heard that voice before but no address or name had popped up on the display. Probably the caller was using a cell phone. Zak had no trouble placing the caller then. The Stillmans owned the largest ranch in the county, and Eugene’s mother, Lacy Stillman, was the wealthiest woman around. Eugene was her eldest son. His voice sounded like it was grinding through gravel until it finally choked to a stop. Zak waited for the tough, old rancher to get control. For men like Eugene it was weak to show emotion. “What’s the story?” Nadine Black towered over his desk, vibrating with anticipation of a juicy emergency. The fitness she’d gained in her years of competing in barrel racing still showed in every muscle of her body. “Lacy Stillman had a heart attack in bed last night.” A part of him was still absorbing the news. Just yesterday she’d invited him for a beer after her annual checkup with Doc Pittman. It wasn’t like they were drinking buddies or anything. He just happened to cross her path at the right time. She felt like celebrating, she said. Encouraged by the moment of rapport, Zak considered asking her about last night, why she hadn’t shown up at the Dew Drop as planned. But she was already back at her desk. 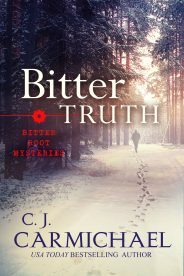 He eyed the stiff set of her shoulders a few seconds longer, then dialed Doc Pittman, the county coroner. Zak wanted to argue the point, for reasons that were slowly coalescing in his mind, but he was just the dispatcher. So he did as instructed. Nadine glanced up from her computer screen. The old radiators clicked and clunked, the sounds loud in the quiet office. Sheriff Ford was in Missoula for the day and Deputy Butterfield was patrolling the Bitterroot Forest Preserve. Not much else was going on. A normal state of affairs in this sleepy corner of Montana. Lacy had been dressed like a rodeo queen with her hand-tooled boots and fitted shearling coat. Petite and sprightly, with alert, bright eyes and an I-love-life smile. No one would guess Lacy was in her nineties. She still led cattle drives every spring and fall and volunteered for the 4-H club. Really? A few weeks ago she’d given him hell for not applying for a deputy position. Now she questioned whether he could handle the dispatcher role—a job previously held by Rose Newman, whose main skill, as far as Zak could tell, had been crocheting doilies for every wooden surface in the office. Unlike Lacy who had an excellent one. Her eyes had sparkled with mischief when she told him her sons were going to be thrilled the doc had green-lighted her continued active involvement on the ranch. The irony was obvious. It was no secret around town that Lacy’s old-fashioned ideas about ranching drove both Eugene and Clayton crazy. “No, he won’t open an investigation.” Especially since Eugene and Clayton were generous supporters of his campaign and election time was around the corner. 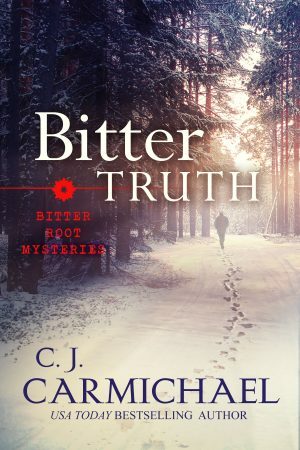 Did you know that Bitter Truth and many titles are available digitally from Tule's own bookstore? Check it out!